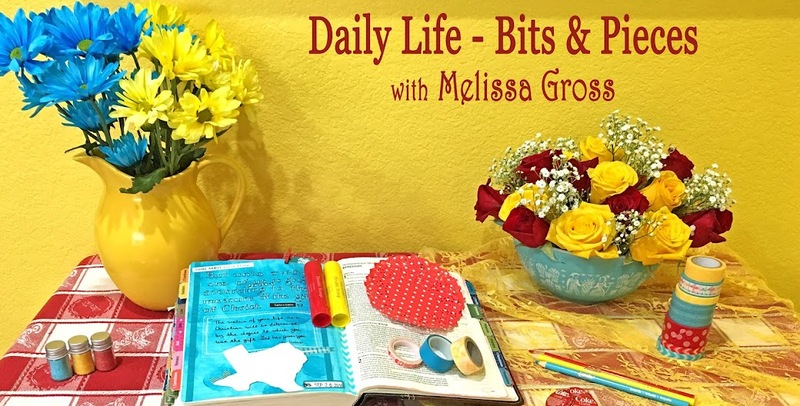 Daily Life - Bits & Pieces: Hello December! Wow, November certainly flew by, didn't it? We had a fabulous month, especially since Robbie was off work for two weeks! But first, there was the Presidential Election here in the states. This was one of the most grueling campaigns I've ever witnessed! 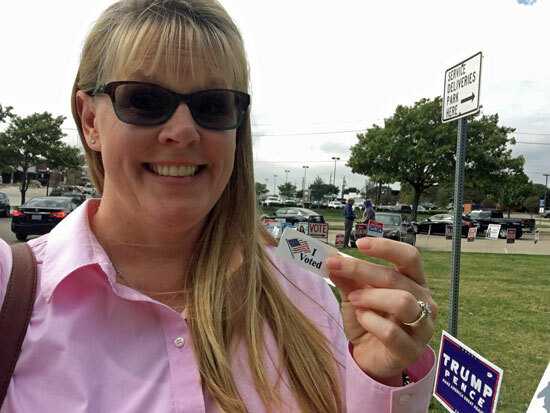 Honestly, I wasn't happy with either candidate, however I got out and voted early to avoid the lines on election Tuesday. We stayed up all night watching the election results roll in. I have to admit that it was somewhat humorous watching most of the liberal media trying to hold it together when they realized the election results were not what they were expecting. 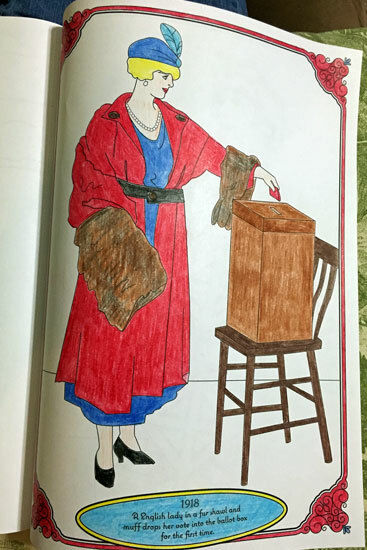 I had plenty of time to color this page of a woman putting her red ticket in the ballot box. Since then, I've read so many negative posts about the election that it makes my heart sad. I've never seen our country so divided. 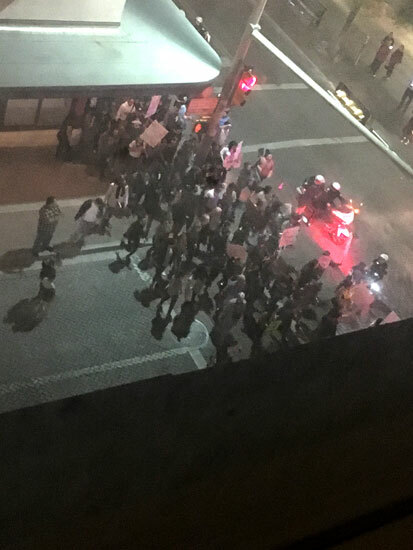 I've also never seen a protest after an election, like the one we witnessed outside our hotel in San Antonio. Honestly, when we looked out the window to see where all the racket was coming from, my heart skipped a beat because many of the protests have turned violent. However, this protest continued down the street peacefully, if somewhat loudly. I honestly don't know what the answer is to all the unrest that we've witnessed in our country and around the world this year, however my personal goal is to show kindness to everyone. 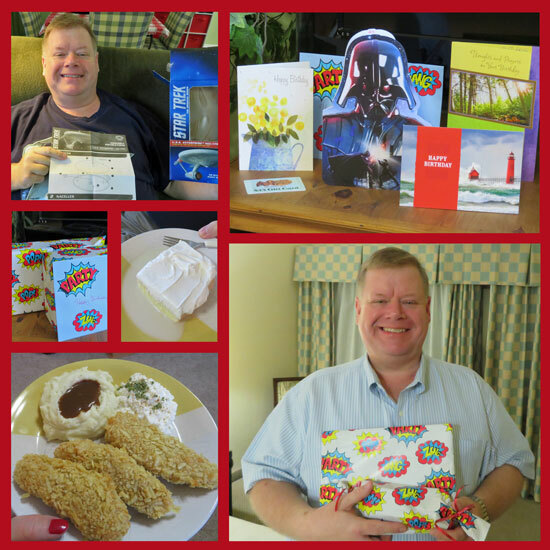 We celebrated Robbie's birthday with a quiet day at home. I made tres leches cake and oven friend chicken - Robbie's favorites! 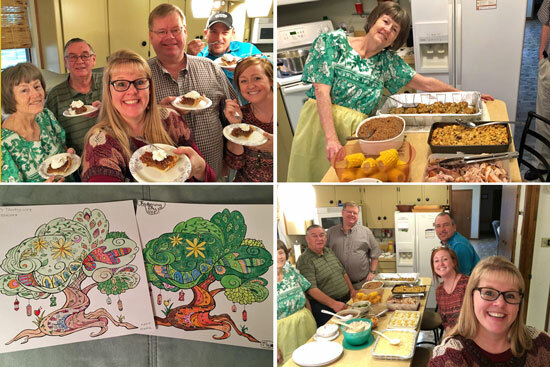 We spent Thanksgiving Day at my parent's house - having pie at 10am, visiting, eating, watching the Dallas Cowboys win again, and playing games. Mama & I even colored matching pages from one of my coloring books! We also enjoyed visits with two of our missionary friends this month. Becky surprised me by stopping by Personal Scrapbook one day that I was working the store while the owner was away on vacation. 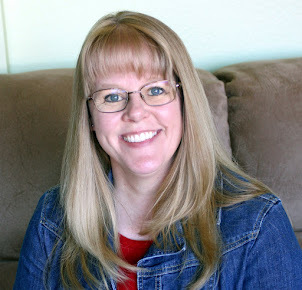 She and her husband Don are currently missionaries in Kenya, East Africa. It was so nice to visit and catch up. They are in the states until the first of the year, so we're hoping to link up with them sometime this month as it's been a couple of years since the four of us were together. We haven't seen our friend Billy in five years, so it was especially nice to spend an evening with him while he was here on a brief visit. Billy is a missionary in the Philippines. Several days later we were able to have a Skype chat with him and his new wife (who was not able to travel with him this time). With all that going on, I was still able to accomplish a little toward my 2016 goals (MOVE, LEARN, TEACH, SCRAP, CLEAN). MOVE - We did a lot of walking on our vacation, which counts for exercise, adventure and activity, right? LEARN - I did not take any classes during November, however I'm currently catching up on the FIT 2016 class materials. TEACH - After teaching numerous classes over the past couple of years, I was glad to have the month off and have decided to take a break from teaching. 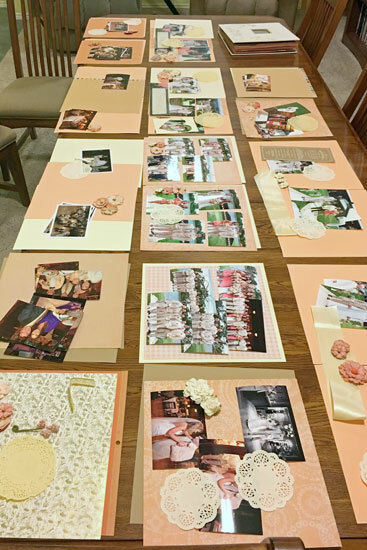 SCRAP- I completed the first of the custom wedding scrapbook-for-hire projects and am happy to report that my client was thrilled with the completed album! I'll share photos of the pages in a future post, but here's a behind-the-scenes look as I was working on it. CLEAN - We completed several projects here at home. 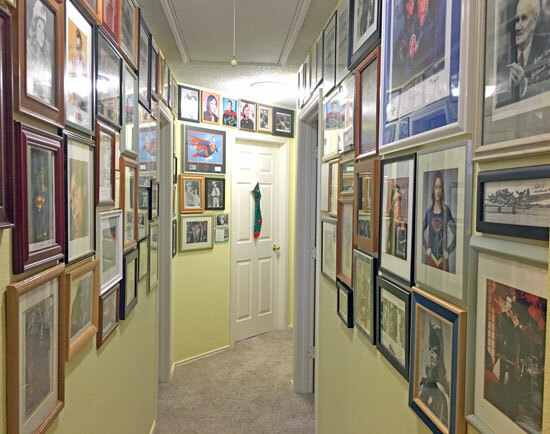 The wall right outside the old toy room/new craft room used to be covered with Robbie's collection of autographs. I removed all those autographs, moved the game shelves that were underneath, filled all the nail holes, and repainted the wall so that we could relocate my Memories Shelf to this wall. As you can see, we started our Christmas decorating; we're finishing up a few bits & pieces this week. I'll share more photos soon. Did you accomplish your goals for November? What are your plans for December? looks like you've been very busy again, it's the first time my family have stayed up to watch your election results! That's a lovely length of displayed photos ... hoping you enjoy the break from teaching. Looks like a full month! You have some fascinating collections! I'm still in disbelief that it is already December - just wow. LOVE your memories shelf! It's so pretty! (say it like "It's so FLUFFY!" and you'll understand how much I like it). 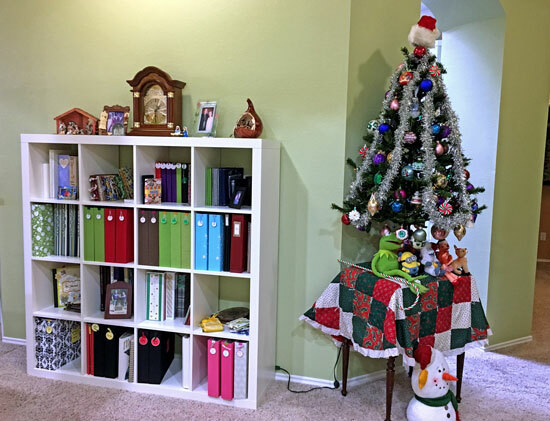 We have a start on Christmas decorating too - not quite done yet.